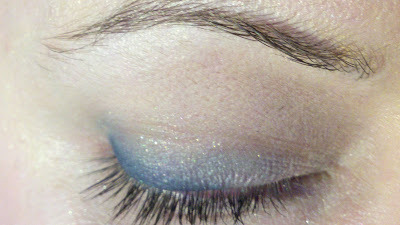 polish insomniac: Late for the first day of work EOTD! I wore this on Monday to my first day in my new position. I hate being late, but I get so distracted by my makeup! I usually spend a good 10 minutes playing with my eye makeup in the morning... I did this in maybe 3 minutes. Please ignore the fact that I have foundation stuck in my eyebrow. I am embarrassed, but I would hate to resort to photoshopping my own images. I am NOT that vain! Oh no! I found a new mascara that I like. I am cheatin' on my HG mascara, and it KNOWS! 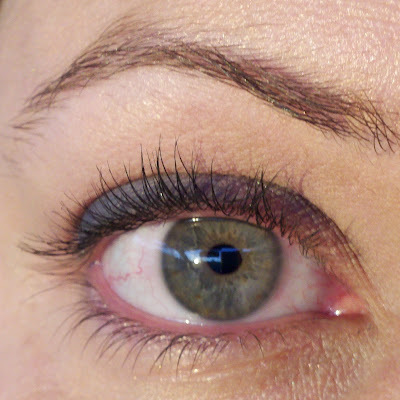 But I couldn't get my blinc mascara to open, so I grabbed the Armani sample of Eyes to Kill. I can't believe how BLACK my lashes look! I love it! Uh oh! This can't be good. I wonder how much Armani mascaras are? Can't be too much, right??? *goes to look* FECK!